Despite what the calendar says, most of the country is still smack dab in the oppressive heat of the summer. And though we may yearn for the cozy spirits and special-release beers that make fall so damn special, as the unrelenting mid-summer heat clings to us into September, a warm-weather beverage may be the best way to find refuge. 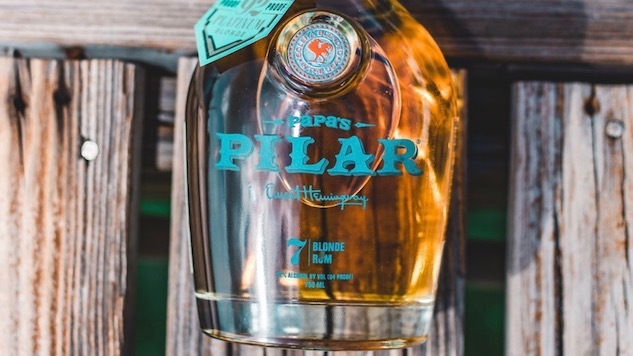 You should consider turning to the new, limited-release rum from Papa’s Pilar to combat the stubborn demands of Mother Nature’s heat flashes. The new Platinum Blonde, which is limited to only 2,000 cases, is a blend of rums that have been aged between two and seven years, all sourced from five locales in the Caribbean, Central America, and the States. All are column-distilled, expertly blended, and then aged in bourbon barrels and Spanish sherry casks, resulting in a high-proof (92% ABV) spirit modelled after the sipping rums popular throughout Cuba. It stands proudly on its own, with bright citrus notes on the nose and tastes of mango, citrus, and vanilla that’s smoother than its high-octane alcohol level might imply. Over rocks with a bit of lime or lemon, and it goes down almost too smoothly. But add it to a Ti Punch, Martinique’s national cocktail and the Caribbean’s answer to the Old-Fashioned, and you may want the heat to linger longer. Just mix two ounces of the rum with a teaspoon of sugar cane syrup and garnish with a lime wedge. Summer respite, perfected. The name Pilar refers to Earnest Hemingway’s boat of the same name, and Papa’s Pilar rums are developed in conjunction with that famed author’s estate. The Hemingway family donates 100% of all profits to charities close to the Lost Generation icon’s heart, like the International Game Fish Association. And a distillery opened recently in Key West, the city where Hemingway once resided (and perished), so if you’re longing for more of that summer heat and Papa’s Pilar rum long after winter kicks in, Florida is only a short flight away.